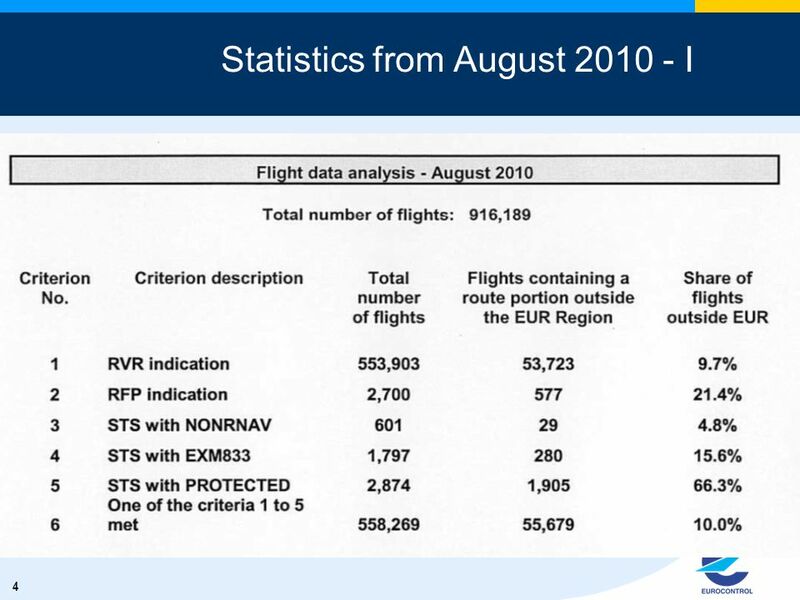 European Organisation for the Safety of Air Navigation 2012 FPL Task Force Revised Specifications for 2012 FPL in EUR Region Andrew Hill, Eurocontrol. 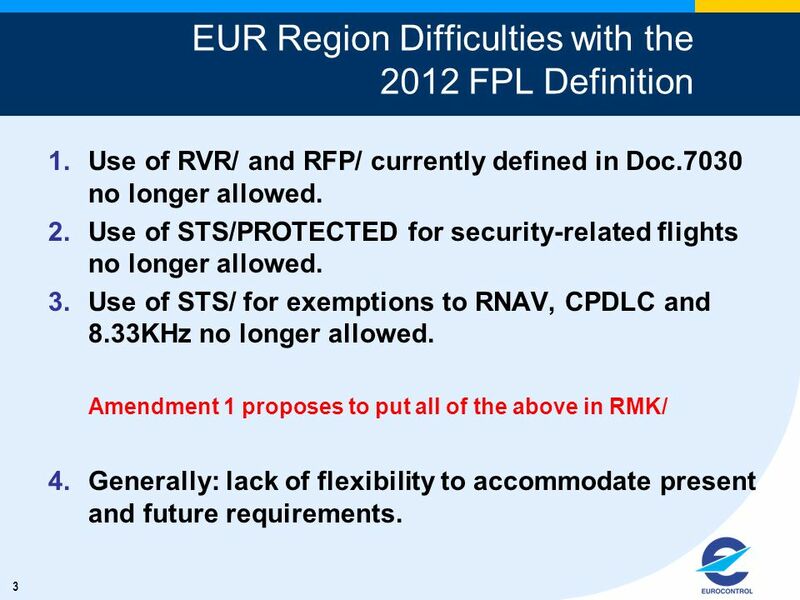 3 3 EUR Region Difficulties with the 2012 FPL Definition 1.Use of RVR/ and RFP/ currently defined in Doc.7030 no longer allowed. 2.Use of STS/PROTECTED for security-related flights no longer allowed. 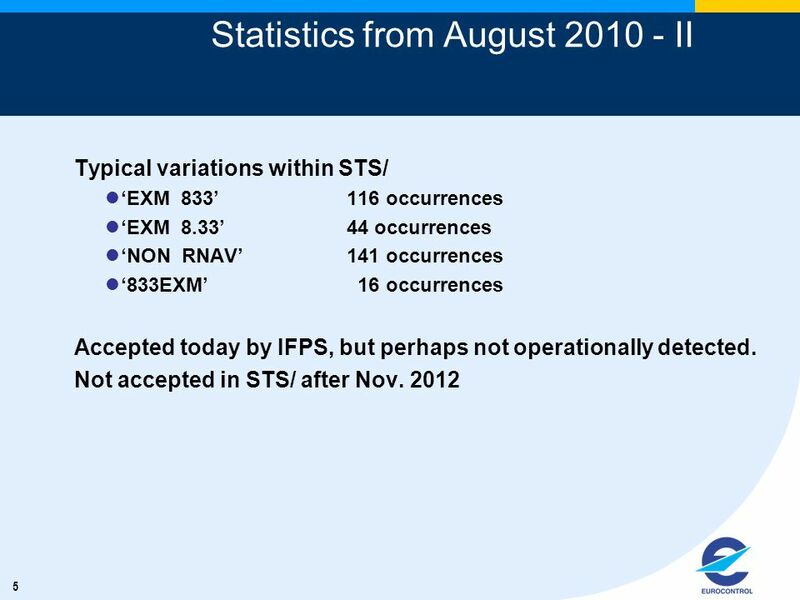 3.Use of STS/ for exemptions to RNAV, CPDLC and 8.33KHz no longer allowed. Amendment 1 proposes to put all of the above in RMK/ 4.Generally: lack of flexibility to accommodate present and future requirements. 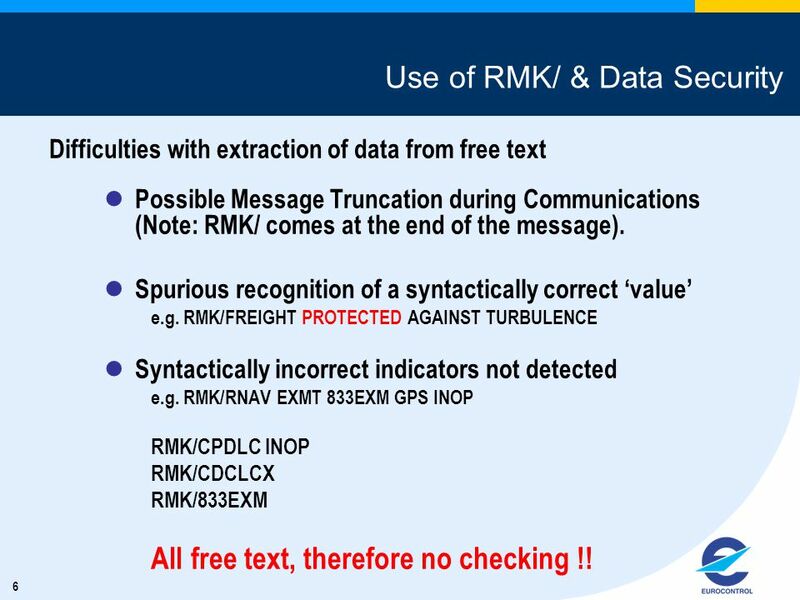 6 6 Use of RMK/ & Data Security Difficulties with extraction of data from free text Possible Message Truncation during Communications (Note: RMK/ comes at the end of the message). Spurious recognition of a syntactically correct ‘value’ e.g. RMK/FREIGHT PROTECTED AGAINST TURBULENCE Syntactically incorrect indicators not detected e.g. 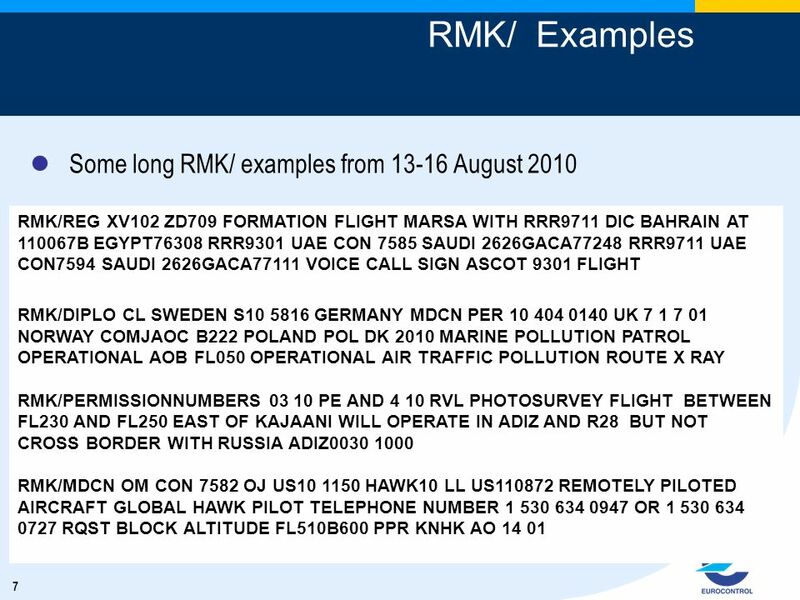 RMK/RNAV EXMT 833EXM GPS INOP RMK/CPDLC INOP RMK/CDCLCX RMK/833EXM All free text, therefore no checking !! 8 8 EUR Region proposed Amendment to Doc.7030 1.Amend Doc. 7030 to satisfy the EUR Region requirements Retention of RVR/ and RFP/ as currently specified Introduction of EUR/ to provide specific EUR status and exemption indications (PROTECTED, EXM833, RNAVX, CPDLCX, RNAVINOP) 2.Proposed amendment to Doc. 7030 approved by EANPG in December 2010, and sent to ICAO HQ in January 2011. 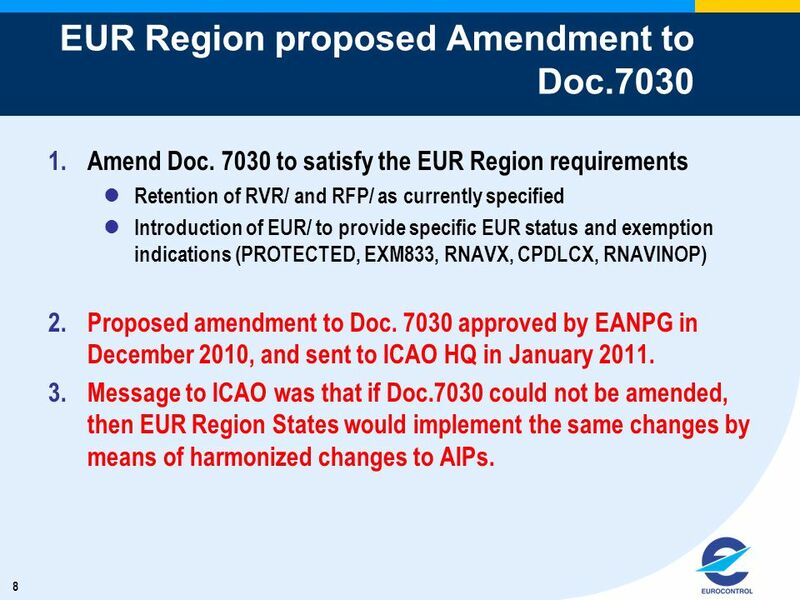 3.Message to ICAO was that if Doc.7030 could not be amended, then EUR Region States would implement the same changes by means of harmonized changes to AIPs. 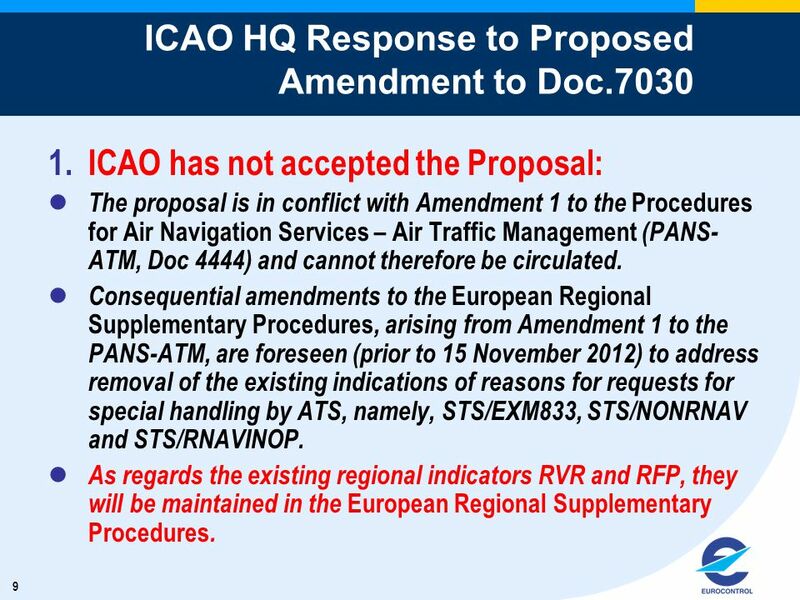 9 9 ICAO HQ Response to Proposed Amendment to Doc.7030 1.ICAO has not accepted the Proposal: The proposal is in conflict with Amendment 1 to the Procedures for Air Navigation Services – Air Traffic Management (PANS- ATM, Doc 4444) and cannot therefore be circulated. 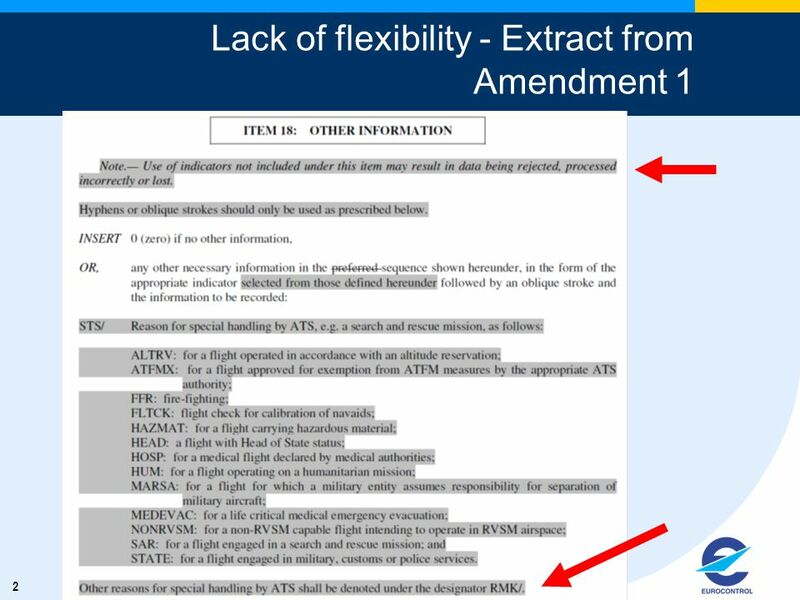 Consequential amendments to the European Regional Supplementary Procedures, arising from Amendment 1 to the PANS-ATM, are foreseen (prior to 15 November 2012) to address removal of the existing indications of reasons for requests for special handling by ATS, namely, STS/EXM833, STS/NONRNAV and STS/RNAVINOP. As regards the existing regional indicators RVR and RFP, they will be maintained in the European Regional Supplementary Procedures. 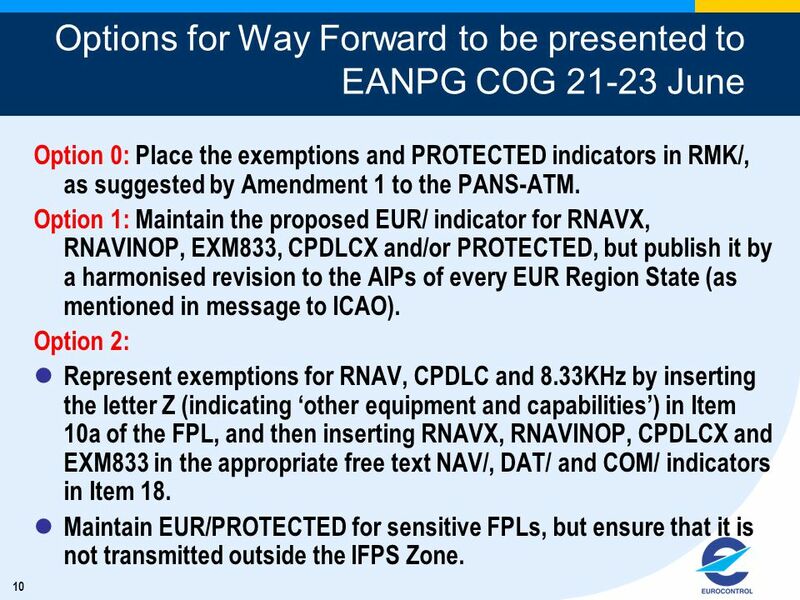 10 10 Options for Way Forward to be presented to EANPG COG 21-23 June Option 0: Place the exemptions and PROTECTED indicators in RMK/, as suggested by Amendment 1 to the PANS-ATM. 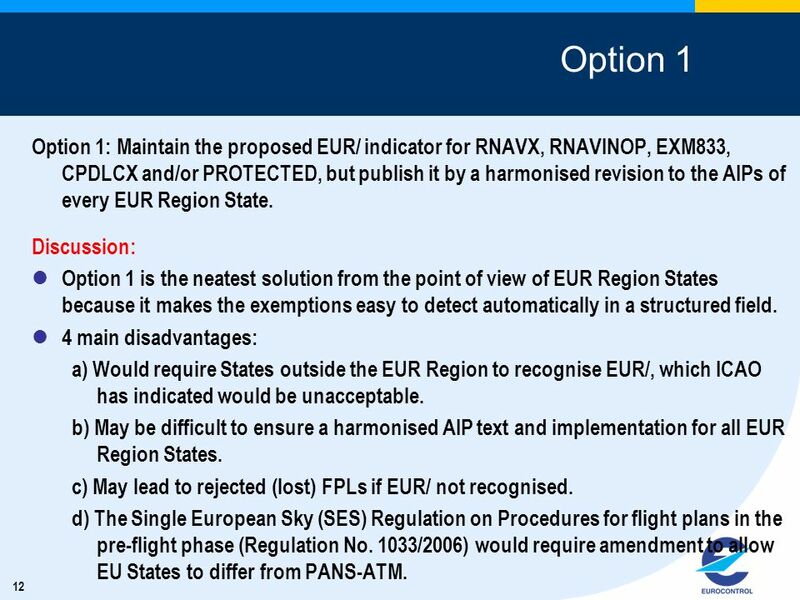 Option 1: Maintain the proposed EUR/ indicator for RNAVX, RNAVINOP, EXM833, CPDLCX and/or PROTECTED, but publish it by a harmonised revision to the AIPs of every EUR Region State (as mentioned in message to ICAO). Option 2: Represent exemptions for RNAV, CPDLC and 8.33KHz by inserting the letter Z (indicating ‘other equipment and capabilities’) in Item 10a of the FPL, and then inserting RNAVX, RNAVINOP, CPDLCX and EXM833 in the appropriate free text NAV/, DAT/ and COM/ indicators in Item 18. Maintain EUR/PROTECTED for sensitive FPLs, but ensure that it is not transmitted outside the IFPS Zone. 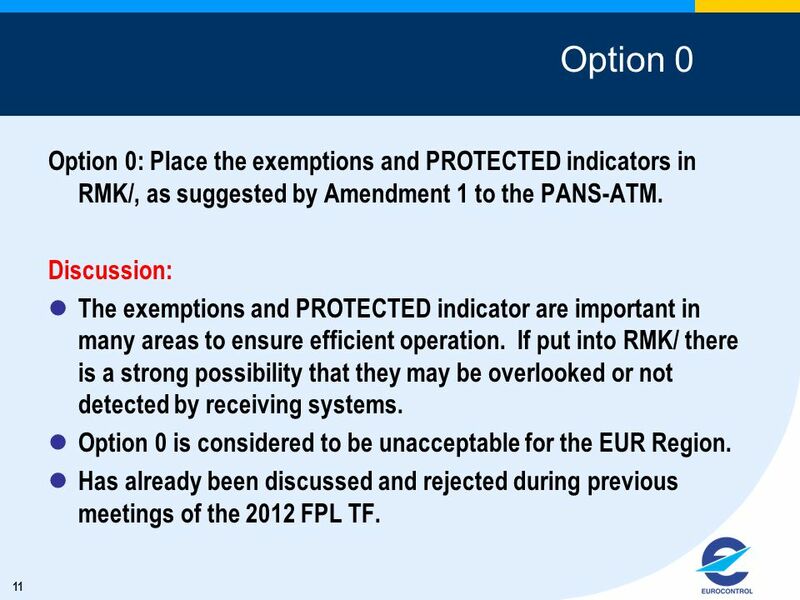 11 11 Option 0 Option 0: Place the exemptions and PROTECTED indicators in RMK/, as suggested by Amendment 1 to the PANS-ATM. Discussion: The exemptions and PROTECTED indicator are important in many areas to ensure efficient operation. If put into RMK/ there is a strong possibility that they may be overlooked or not detected by receiving systems. Option 0 is considered to be unacceptable for the EUR Region. Has already been discussed and rejected during previous meetings of the 2012 FPL TF. 12 12 Option 1 Option 1: Maintain the proposed EUR/ indicator for RNAVX, RNAVINOP, EXM833, CPDLCX and/or PROTECTED, but publish it by a harmonised revision to the AIPs of every EUR Region State. Discussion: Option 1 is the neatest solution from the point of view of EUR Region States because it makes the exemptions easy to detect automatically in a structured field. 4 main disadvantages: a) Would require States outside the EUR Region to recognise EUR/, which ICAO has indicated would be unacceptable. b) May be difficult to ensure a harmonised AIP text and implementation for all EUR Region States. c) May lead to rejected (lost) FPLs if EUR/ not recognised. d) The Single European Sky (SES) Regulation on Procedures for flight plans in the pre-flight phase (Regulation No. 1033/2006) would require amendment to allow EU States to differ from PANS-ATM. 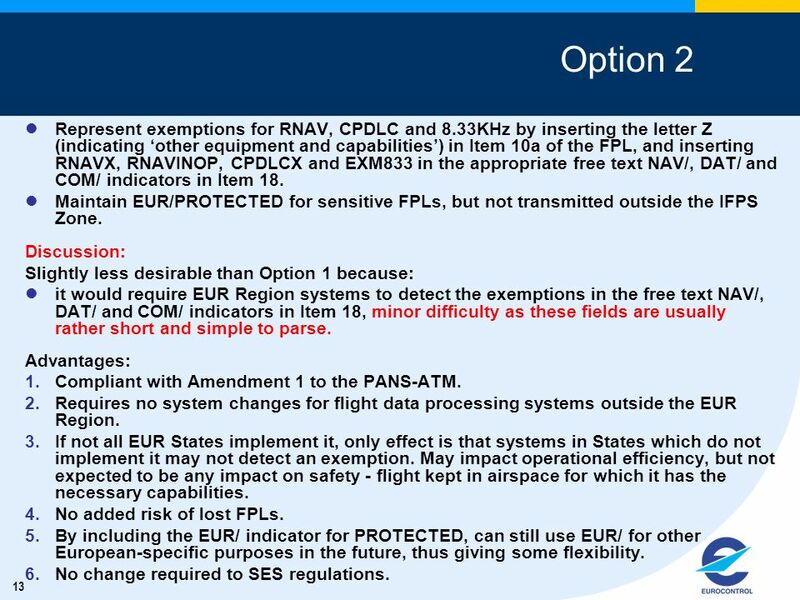 13 13 Option 2 Represent exemptions for RNAV, CPDLC and 8.33KHz by inserting the letter Z (indicating ‘other equipment and capabilities’) in Item 10a of the FPL, and inserting RNAVX, RNAVINOP, CPDLCX and EXM833 in the appropriate free text NAV/, DAT/ and COM/ indicators in Item 18. Maintain EUR/PROTECTED for sensitive FPLs, but not transmitted outside the IFPS Zone. Discussion: Slightly less desirable than Option 1 because: it would require EUR Region systems to detect the exemptions in the free text NAV/, DAT/ and COM/ indicators in Item 18, minor difficulty as these fields are usually rather short and simple to parse. Advantages: 1.Compliant with Amendment 1 to the PANS-ATM. 2.Requires no system changes for flight data processing systems outside the EUR Region. 3.If not all EUR States implement it, only effect is that systems in States which do not implement it may not detect an exemption. May impact operational efficiency, but not expected to be any impact on safety - flight kept in airspace for which it has the necessary capabilities. 4.No added risk of lost FPLs. 5.By including the EUR/ indicator for PROTECTED, can still use EUR/ for other European-specific purposes in the future, thus giving some flexibility. 6.No change required to SES regulations. 14 14 Implementation of Option 2 1. 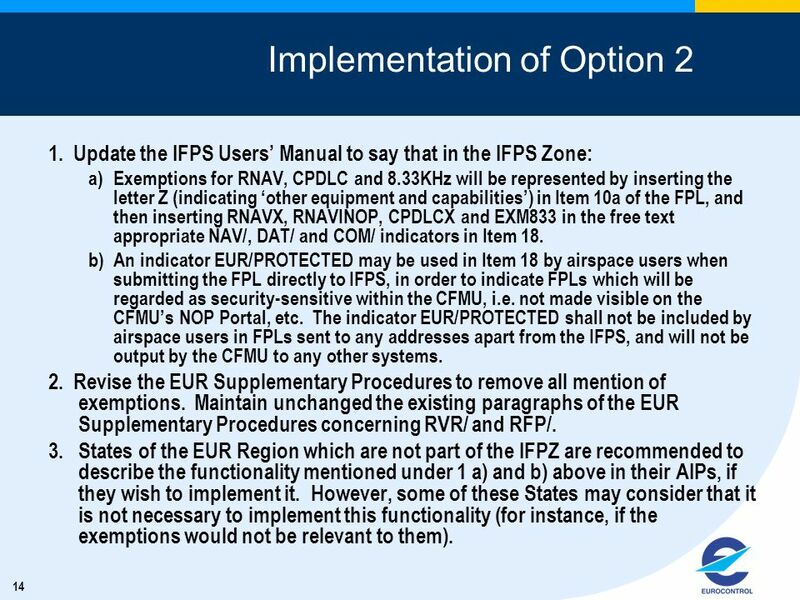 Update the IFPS Users’ Manual to say that in the IFPS Zone: a)Exemptions for RNAV, CPDLC and 8.33KHz will be represented by inserting the letter Z (indicating ‘other equipment and capabilities’) in Item 10a of the FPL, and then inserting RNAVX, RNAVINOP, CPDLCX and EXM833 in the free text appropriate NAV/, DAT/ and COM/ indicators in Item 18. b)An indicator EUR/PROTECTED may be used in Item 18 by airspace users when submitting the FPL directly to IFPS, in order to indicate FPLs which will be regarded as security-sensitive within the CFMU, i.e. not made visible on the CFMU’s NOP Portal, etc. The indicator EUR/PROTECTED shall not be included by airspace users in FPLs sent to any addresses apart from the IFPS, and will not be output by the CFMU to any other systems. 2. Revise the EUR Supplementary Procedures to remove all mention of exemptions. Maintain unchanged the existing paragraphs of the EUR Supplementary Procedures concerning RVR/ and RFP/. 3. States of the EUR Region which are not part of the IFPZ are recommended to describe the functionality mentioned under 1 a) and b) above in their AIPs, if they wish to implement it. However, some of these States may consider that it is not necessary to implement this functionality (for instance, if the exemptions would not be relevant to them). 15 15 Recommendations Option 2 is recommended. 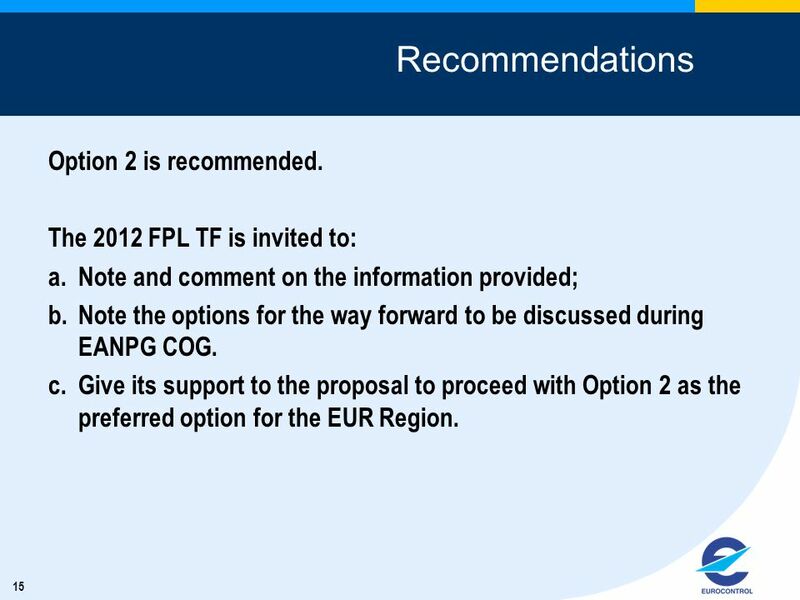 The 2012 FPL TF is invited to: a.Note and comment on the information provided; b.Note the options for the way forward to be discussed during EANPG COG. c.Give its support to the proposal to proceed with Option 2 as the preferred option for the EUR Region. 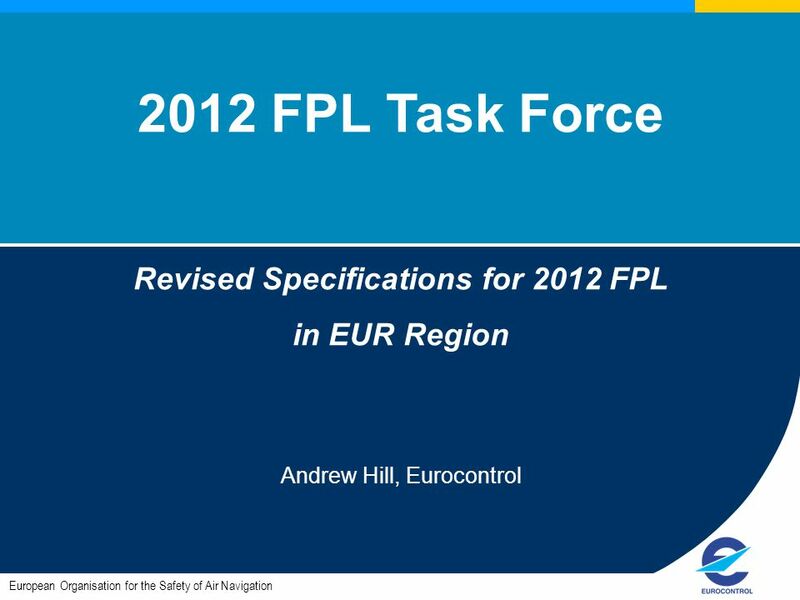 Download ppt "European Organisation for the Safety of Air Navigation 2012 FPL Task Force Revised Specifications for 2012 FPL in EUR Region Andrew Hill, Eurocontrol." © Integra A/S SAFETY MANAGEMENT WORKSHOP Karachi - January 2006 PRESENTERS: PETER THORSEN STEFAN REIB. ICAO FPL 2012 Implementation Workshop Lisbon 16 th February 2012 Kim Breivik Chairman EUR 2012 Task Force Operational Requirements, Network Management. Page 1 CARE/ASAS Activity 3: ASM workshop Brétigny, 19 December 2001 Autonomous Aircraft OSED CARE-ASAS Activity 3: ASM Autonomous Aircraft OSED. APEC Air Cargo Security Workshop Bangkok, Thailand June 2008. Ensuring a 'Flexible Use of Airspace'…. Patrick Delmouzée Head of ATM Unit DSS/CM EUROCONTROL Moving towards an Integrated ASM/ATFCM/ATS Approach EUROCONTROL. International Civil Aviation Organization Aviation System Block Upgrades Module N° B0-86/PIA-3 Improved Access to Optimum Flight Levels through Climb/Descent. International Civil Aviation Organization European and North Atlantic Office OVERVIEW OF THE AMENDMENT - ICAO EUR FPL2012 Workshop Kiev, Ukraine 29 June. European Organisation for the Safety of Air Navigation Presentation to ICAO Workshop Kiev 28 July – 1 July 2010 EUR Regional Implementation of Flight Plan. SC227 – SC214 ISRA – Datalink Interface. PBN Manual, Part A, Chapter On-board performance monitoring and alerting On-board performance. International Civil Aviation Organization Aviation System Block Upgrades Module N° B0-40/PIA-4 Improved Safety and Efficiency through the initial application. International Civil Aviation Organization European and North Atlantic Office Outcome of the ICAO EUR FPL2012 Workshop Kiev, Ukraine 29 June – 1 July 2010.